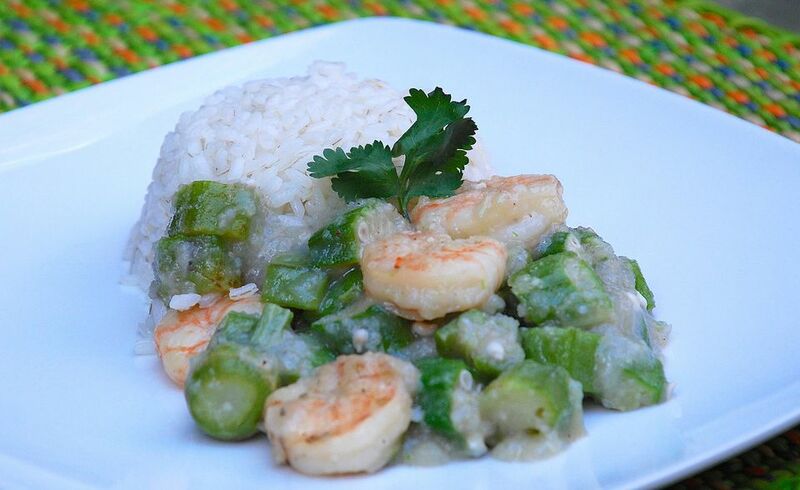 This Brazilian shrimp and okra gumbo is perfect for a healthy weeknight supper. You can use fresh okra and fresh shrimp when they are available, but the dish turns out great with frozen okra and shrimp. The sauce is thickened with manioc meal in some parts of Brazil, and with ground roasted peanuts in others - both are delicious. Cook the okra in boiling water for 3 minutes, and drain immediately. Set aside. Stir the manioc meal into 2 cups of fish stock. Bring to a boil and cook, stirring, for 3 minutes. In a separate pan, sauté the onion and the garlic in the olive oil until soft. Add the shrimp and sauté until pink. Season with salt and pepper. Stir the stock and manioc meal into the pan with the onions and shrimp. Add the okra and stir until heated through. Serve with rice. Peanut variation: Add 1/4 cup ground roasted peanuts directly to the onions and sauté with the onions and garlic. Stir 1 tablespoon corn starch into 1 cup fish stock and add to the onion mixture. Simmer, stirring, until mixture thickens, then stir in the shrimp and okra and heat until warmed through.